Rupee at the lowest level of 14 months closed at Rs 66.90 per dollar. Rupee pared at 66.47 per dollar in the intra-foreign currency market. During the late afternoon trade, it went down to 66.91 and the rupee closed at 52 paise or 0.78 per cent down at 66.90 rupees per dollar. Rupee plunged by 52 paise to 14-month low of Rs 66.90 per dollar in morning on emergence of crude oil prices and concerns over macroeconomic issues. This shows the third decline of daily business for the third time this year. This is the lowest closed level after 22 February 2017. After the revision of yesterday (Tuesday), after the indiscriminate loss of corporate companies and importers, the rupee was falling. 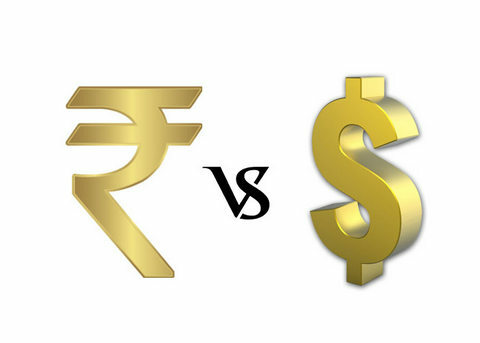 Intervention of the Reserve Bank of India also failed to stem the rupee decline to pause the ruptured rupee in the mid-afternoon business, but it managed to save the psychological level of $ 67 per dollar. The rupee had closed at a record high of 66.38 against the dollar after six days of gains and 10 paise higher. Rupee pared at 66.47 per dollar in the intra-foreign currency market. During the late afternoon trade, it went down to 66.91 and the rupee closed at 52 paise or 0.78 per cent down at 66.90 rupees per dollar. The Reserve Bank of India had fixed the reference rate for USD-Rupee trade at Rs 66,6983 and Rupee 81.4253 per euro for Euro-Rupee today. In the intermediate business, the rupee declined in comparison to the pound, euro and Japanese Yen.